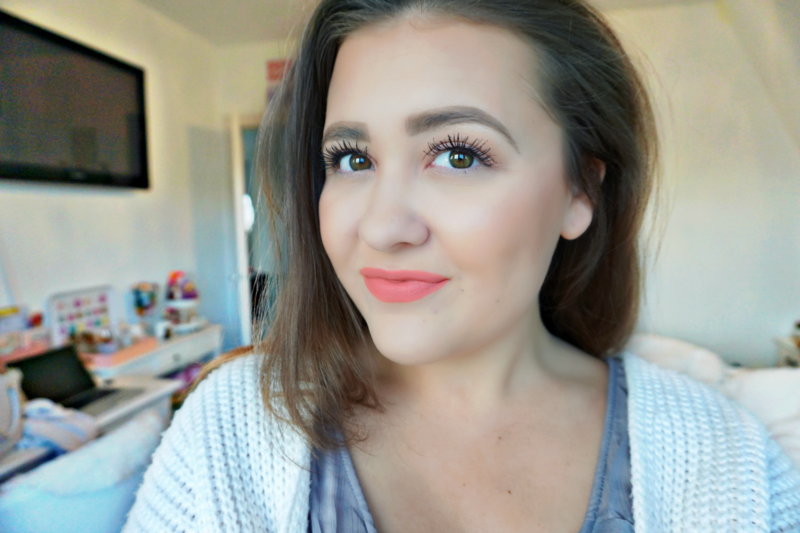 As you guys probably know already, I only like to talk about cruelty-free makeup here on my blog. I’m a huge animal-lover and I just don’t see the point in harming animals when there are other, better alternatives. That being said, if a makeup brand comes out with anything animal-related, I’m all for it. I’ve been a huge fan of Kat Von D (and here makeup line) because she truly cares about animals and will do anything to help them along the way. She doesn’t test her makeup on animals and everything is vegan, which I adore! She recently (as in a few months ago, I’m a bit late) released a total of four Everlasting liquid lipsticks from which 20% of the retail price goes to the Farm Sanctuary. I’ve always been so interested in getting my hands on one of the shades, but it’s been a struggle managing to do so! Luckily, the shade Julia was in stock during the Sephora VIB Sale, so I finally got my hands on Julia, which is named after a little pig! 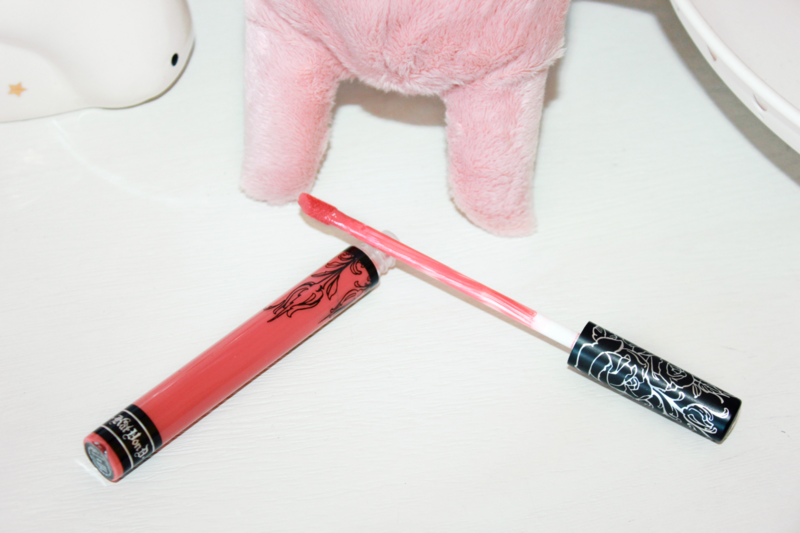 The actual liquid lipstick doesn’t have a special design for this collection, it just comes in the typical clear tube with a black and silver tattoo-like flower design. The box it comes in does look really beautiful and has a different design than usual. 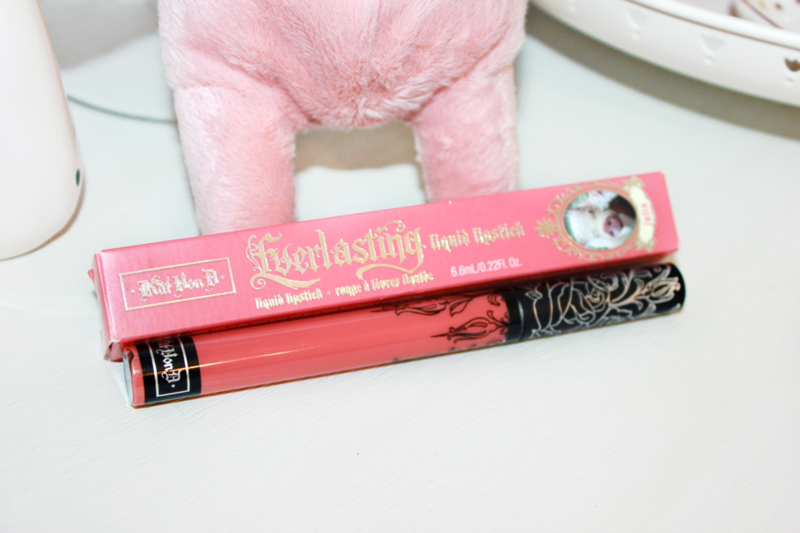 The box has a beautiful shade of pink, which is almost identical to the actual lipstick shade. There’s a really cute photo of Julia the pig on the box, which I think is SO cute! You can also read more about the Farm Sanctuary and how much of the proceeds actually goes the organization on the side of the box, which I think is really important. I’m just so sad to throw this box away. It looks so pretty and without it, you won’t be able to tell the difference from the other Everlasting liquid lipsticks I own. Kat Von D created four super-special lipsticks to benefit a cause that is extremely close to her heart—animal advocacy and compassionate vegan living. As a devoted volunteer and supporter, Kat partnered with Farm Sanctuary, a nonprofit organization that rescues, rehabilitates, and provides refuge for factory farm animals. For every lipstick sold, 20% of the retail price will go directly to Farm Sanctuary to help end animal suffering. Each creamy, color-rich shade was named after one of Kat Von D’s favorite Farm Sanctuary animals. Meet “Julia” the pig, rescued from abuse at a factory farm. Get inspired by the love and compassion behind each Farm Sanctuary animal’s story. Julia is a warm vibrant pink with coral undertones and a matte finish. If you really want to get a full opaque finish from this shade, you do have to apply two layers since one is still a little bit sheer. I usually stick to one coat, which provides me with a semi-opaque finish. 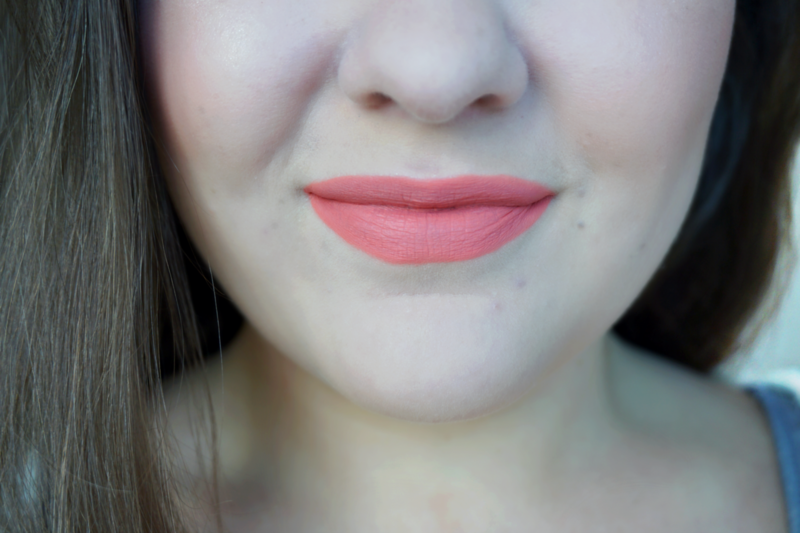 Either way, this is such a gorgeous shade, perfect for Spring & Summer! 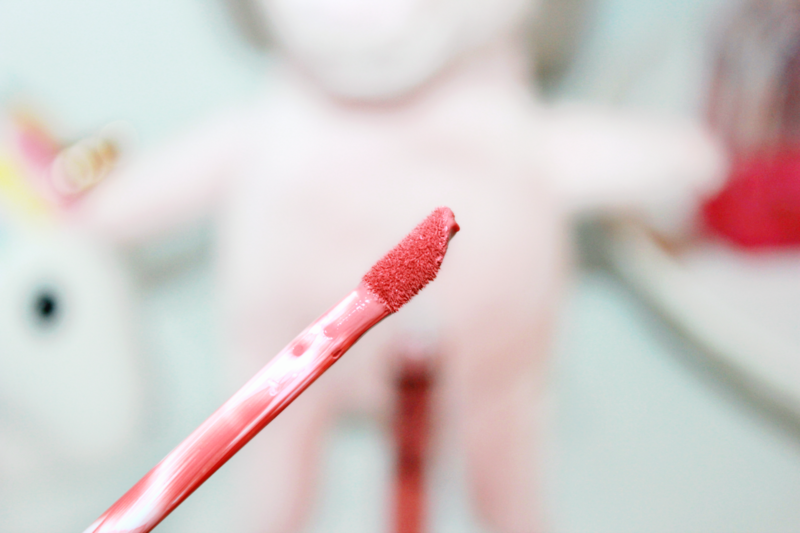 The formula of Julia is just like her other liquid lipsticks more on the thin & watery side, which I really enjoy. The only downside with this shade in particular is that it does apply a little less even than what I’m used to from the other shades in this formula. It can look a little bit streaky on some areas, especially if you have any dry patches on your lips. Also, I noticed a tiny white line forming on the inner-rim of my mouth just where the lipstick ends, which I really hate. That’s why I always have to tap my fingers in that area right after application to prevent that. 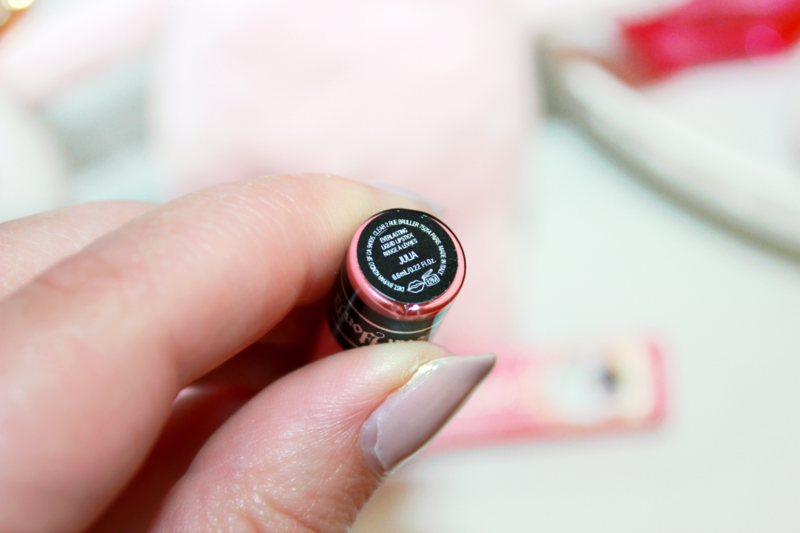 It takes about two minutes for the lipstick to fully settle and dry. I would most certainly avoid pressing your lips together during those two minutes to prevent it from looking really patchy or streaky. What I really love about Kat Von D’s formula is how comfortable her liquid lipsticks feel on the lips. Out of all of the liquid lipstick formulas I’ve tried so far, hers are one of the least drying. Once it starts to fade away, it does so in a nice, clean way without flaking or looking disgusting. You can easily touch-up throughout the day and it won’t look crusty. The applicator is a dough foot sponge that’s slightly slanted at the top. I love her precise wands as it makes it so easy to get a clean and sharp line. It also packs the right amount of product, not too much but still enough to cover up your entire lips. When it comes to the scent, similar to her other Everlasting liquid lipsticks, it doesn’t smell like perfume or contains any fragrance which is awesome! Depending on how much and how greasy you eat and drink throughout the day, Julia will stay on your lips for anywhere between six to seven hours. Her Everlasting liquid lipsticks don’t have the best lasting power ever, but since they’re so comfortable to wear I don’t mind having to touch-up once in a while. I’m wearing the Kat Von D Everlasting Liquid Lipstick in ‘Julia’ on my lips (one layer). My liquid lipstick collection has grown to be so big that it has become almost impossible for me to buy more shades I don’t already own in my makeup collection. But to my surprise, Julia is actually quite a unique shade I didn’t own already! The formula is a little bit harder to work with than her other Everlasting liquid lipsticks I’m used to, but it’s not bad at all. 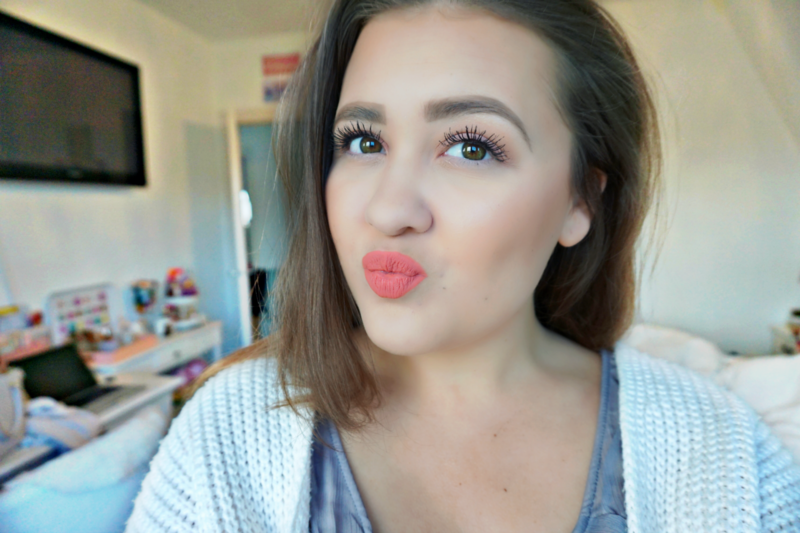 I’m just SO in love with how this shade looks like on me! 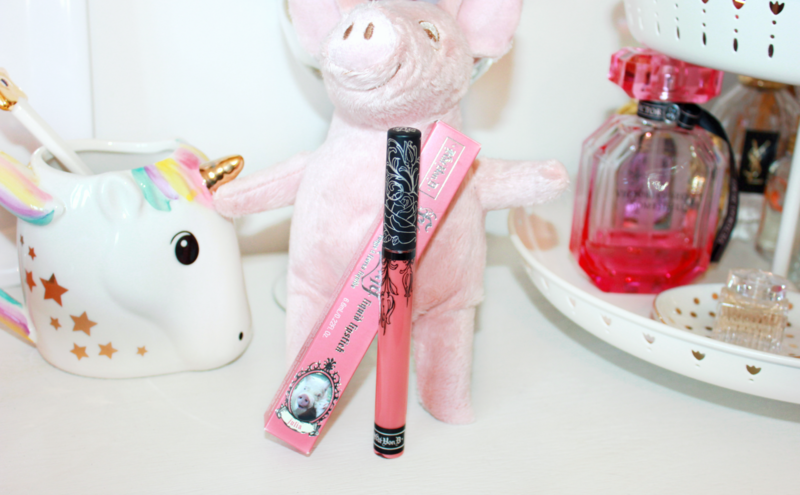 Kat Von D released a total of four shades within her Farm Sanctuary liquid lipstick line, which are all limited edition shades. If you’re interested in picking up Julia, or any of the other three shades, don’t hesitate too long and get yours ASAP! Each of the Farm Sanctuary liquid lipsticks retail for $20 (6.6 ml) and Julia is still available both on the official Kat Von D website & Sephora. Previous Post Full Face Testing $1 Makeup! Shop Miss A First Impressions | Hit Or Miss? !